Mountain Well-Being Colloidal Silver Soap. For clean, healthy skin! This all natural, hand crafted silver soap is simply amazing! All of the water phase is replaced with Mountain Well-Being Colloidal Silver, providing the numerous benefits of colloidal silver to your skin. It's made with organic oils and contains an abundance of silver nano particles that easily penetrate deep below the surface of the skin, down into the depths of each pore. This silver soap is designed to support optimal skin health. It conditions the skin and leaves it feeling soft, smooth and younger looking. Silver soap deodorizes the skin and provides relief from itching. 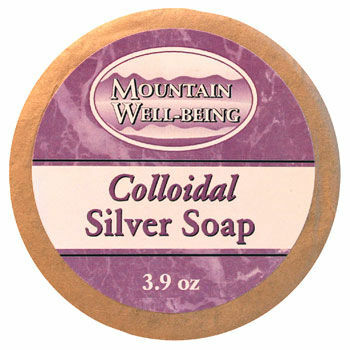 Colloidal silver soap provides numerous benefits to the skin. It contains an abundance of silver nano particles that easily penetrate deep below the surface of the skin, down into the depths of each pore, killing bacteria and eliminating odors. It’s great for helping to clear away skin infections caused by bacteria, viruses, yeast, or fungus. In addition to disinfecting, silver soap conditions the skin by speeding up the growth and repair of cells and tissues, leaving the skin feeling soft, smooth, and younger looking.